Chheng Nuon is a missionary pastor in Cambodia. He started Sovereign Grace churches in two villages - Prek Ambel and Sre Trang. 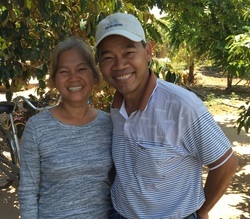 Chheng and his wife Sophorn are members of FBC Parker and are Cambodian nationals. God preserved Chheng's life and that of his family through the reign of Pol Pot and the brutal killing fields. After almost twenty years in the United States, the Lord led them to return to Cambodia to share the gospel of God's grace and mercy. We rejoice at God's blessings upon Chheng and the work of church planting in Cambodia. Bill & Jennifer were teachers at the Prek Ambel Training Center. Bill taught guitar, computer technology and the Bible, as well as helped to translate Christian classics in to Cambodian (Khmer). Jennifer taught English as a second language (ESL). In 2011, the Hales returned to the USA to work with FBC Parker, their home church, where Bill is serving as a Pastor/ Elder. Bill continues to assist in translation work part-time over the internet. Ted and Alicia were sent out from Grace Fellowship Church in Indian Trail, NC. Ted taught ESL, computer technology and the Bible. In 2015, they returned to their home state of North Carolina.